Sergeant Stephen Mette and Students at “Lunch with an Officer” Event is a picture, with genre photograph and group portraits. It was created on Monday, January 29, 2018. 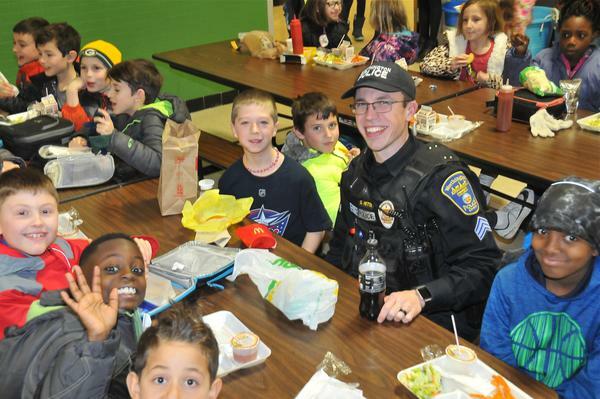 Sergeant Stephen Mette and students smile for the camera during a “Lunch with an Officer” event at Worthington Estates Elementary School. It covers the topics schools, students, police and children. It features the person Sgt. Stephen Mette. The Worthington Memory identification code is cow0112. This metadata record was human prepared by Worthington Libraries on September 23, 2018.